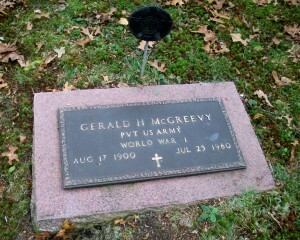 Born: August 17, 1900 in Colchester Vt.
Died: July 23, 1980 in Cataumet Ma. at 79 yrs. Where Lived: 124 Red Brook Harbor Rd. in Cataumet Ma. Married: September 16, 1926 in Falmouth Ma. 1. Joan McGreevy Leary; (June 19, 1927 – November 13, 2011); Married Robert Paul Leary, Col. (1927 – 1969) (Joseph Leary & Mary (–)); They had four children; Joan, Robert & their son Joseph Mark Leary are buried in Cataumet Cemetery. 2. Eleanor Robin McGreevy Karns; (February 1, 1929 – November 1, 1974); Married Andre Maurice Karns, WW ll, Korea, Vietnam (1926 – 2002) (Maurice Karns & Aimee Sanborn) on Abt. 1966; They had two children; E. Robin is buried near her parents in Cataumet Cemetery; Andre is buried in Arlington National Cemetery. 3. Terence Taylor McGreevy; (1935 – ? ); Married Carole Ann MacFawn (1937 – ? ); They had one child.